uuid : c719c265-b22c-4300-88e9-3283f26e57c2 templates_id: 119537 templates_uuid: "2476563c-e6d4-4c30-8713-27fbcc2a3f78" title: " s146 Notice - Notice of Breach of Covenants - Section 146 Notice" display_name: "Notice of breach of covenants" meta_keywords: "Section 146 notice" description: "
Give notice to a tenant that they are in breach of the lease with this section 146 notice. This breach of covenant notice will allow you to take the first step to forfeiting the lease if the breach is not rectified. It covers details of the breach, formal requirements for the notice to be valid, and a request for compensation. What is a breach of covenant notice? A breach of covenant notice - also known as a Section 146 notice (which reflects the relevant section under the Law of Property Act 1925) - can be served on tenants who are in breach of a covenant under their lease. It is the first legal step towards forfeiting the lease. 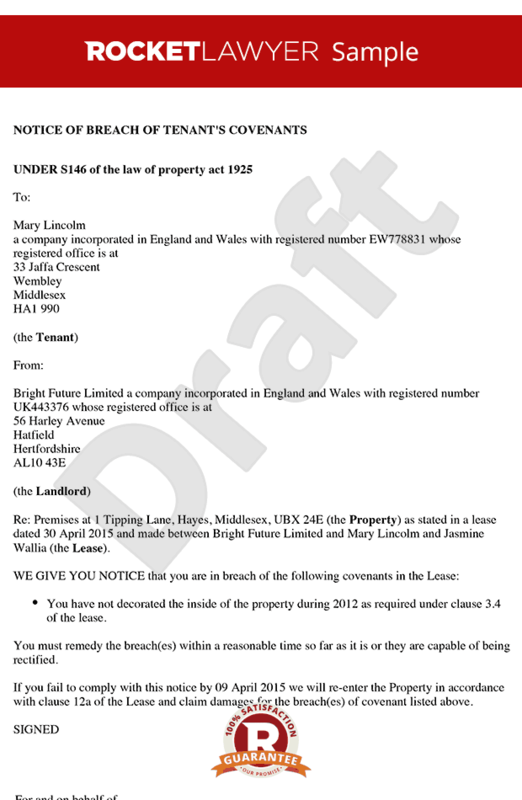 Typically, this type of notice is only used in respect of commercial leases. What is a covenant in a lease? Covenants are essentially rules contained in a lease which set out the obligations of a tenant (or leaseholder) under the terms of the lease. There can be restrictive covenants (eg. not allowing pets inside the property or prohibiting the installation of hardwood flooring) or positive covenants (eg. cleaning the windows once every six months or replacing blown light bulbs). Why do I need a breach of covenant notice? If a landlord is made aware of a tenant breaching covenants under a fixed term lease, and the leaseholder is not in rent arrears, issuing a Section 146 notice may be the best way of taking legal action with a view to forfeiting the lease. A breach of covenant notice provides details of the breach, informs the tenant how to rectify the breach and may also outline any potential compensation. What are some common types of breaches of covenant by tenants? Sub-letting parts or whole of the property without consent. How much time should I give a tenant to rectify a breach? A Section 146 notice should allow the tenant a \302\223reasonable\302\224 time to rectify the breach. What is considered \302\223reasonable\302\224 will vary depending on the particular situation. So, for example, more time will need to be given to a tenant to repair significant damage compared to removing their vehicle from another tenant\302\222s parking space. What are the consequences of breaches of covenants by tenants ? Initially, tenants will be expected to rectify any breaches of their covenants. If they fail to take remedial action, they can be served with a Section 146 notice and the lease can be forfeited. When can a breach of covenant notice not be used? A Section 146 notice cannot be used on account of non-payment of rent. But this is not really an exclusion; in the case of rent arrears, this notice is not actually required in order to take further steps towards forfeiting a lease. What are the next steps after a breach of covenant notice has been served? Once the notice has been served, landlords should ensure that the leaseholder has received and understood how the covenant has been breached, and then provide a reasonable amount of time for the breach to be remedied. Compensation may also be requested as part of the Section 146 notice. If a tenant fails to put right the breach, steps can be taken towards forfeiture of the lease, repossession as well as any claiming compensation. Ask a lawyer for more information. This notice is governed by the law of England and Wales. \r\n" created_timestamp: "2018-10-08 04:36:44.0" modified_timestamp: "2018-10-08 04:36:44.0" active: true created_by: 104 modified_by: 104 dcm_id: 290 url_slug: "Notice-of-breach-of-covenants" meta_description: "Draft a section 146 notice with guidance from Rocket Lawyer. Make sure to give notice to a tenant that they are in breach of the lease and that this breach should be put right. Try this breach of covenant notice." time_to_complete: "10 minutes"
A Section 146 notice should allow the tenant a reasonable time to rectify the breach. What is considered reasonable will vary depending on the particular situation. So, for example, more time will need to be given to a tenant to repair significant damage compared to removing their vehicle from another tenants parking space. More than just a Notice of breach of covenants template, our step-by-step interview and guidance makes it easy to create your document. Easily create online, download, print and sign your free Notice of breach of covenants in minutes. This document is also sometimes called: Section 146 notice.